Vernee to be first with phones powered by the Helio X30 and Snapdragon 830 chipsets? Earlier today, we told you that Chinese smartphone manufacturer Vernee had introduced its latest handset, the Vernee Mars. Now comes a report that says the little known smartphone manufacturer will be the first to offer handsets powered by both the Snapdragon 830 chipset, and MediaTek's Helio X30 SoC. 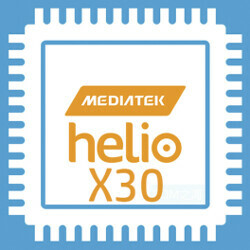 The Vernee Apollo 2 will supposedly be the first to market with the Helio X30 inside. This is a chip manufactured with the 10nm process and has ten cores running with a clock speed as fast as 2.8GHz. The Vernee Apollo 2 could feature a Super AMOLED screen with a resolution of 1440 x 2560. Since the Helio X30 supports 8GB of RAM, it wouldn't be terribly surprising to find 8GB of the sweet stuff packed inside the unit. A premium version of the Apollo 2 is going to have a 'first' of its own to brag about. The Vernee Apollo 2 Pro will allegedly be driven by the Snapdragon 830 chipset, the next top-of-the-line SoC to come out of Qualcomm. The phone is expected to be unveiled in May 2017. Both the Vernee Apollo 2 and the Vernee Apollo 2 Pro will have Android 7.0 pre-installed. And if this report does come true, we can predict that Vernee won't be as unknown as it is now. Does anyone else think it's time Google started cutting down on the number of 'OEMs'? They literally can't do that lol. i think that google should force everyone to use stock android on their phones, thats it! They tried that, but it failed dismally. But the ZTE Axon 7 and OnePlus 3 are close enough. All manufacturers, should make subtle difference in design, but differentiate in extra features. That would defeat the whole point of Android. Interesting. Hopefully they stick with the "Vernee Apollo Lite" look. I personally love the OnePlus One front meets OnePlus 3 back. Stunning looks!! Before May of 2017 already has coming out The Galaxy S8, the LG G6, the HTC M11 and the One Plus 4 with Snapdragon 830. Vernee have some official stores in Germany, Spain and Romania. So I suppose they are not so unknown anymore. Chinese products have such a stigma! Interesting at least. But in this case It would be a leap of faith that i wont take: for me those Agm ruggeds of 160 euros were a lucky strike and i ll follow them. This verneem, tho... doesnt satisfy me for that price.